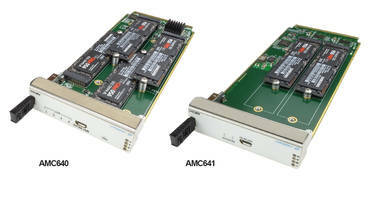 VadaTech’s NVMe Host Bus Adapter AMC Modules are available in AMC640 and AMC641 models. AMC640 module supports up to four M.2 type 2280 and /or 22110 style storage devices. The modules are offered in air-cooled (MTCA.0 and MTCA.1) and conduction cooled (MTCA.2 or MTCA.3) versions. Units allow user to route 4-7 or 8-11 ports to any combination of the M.2 modules. Henderson, NV – May 31, 2018 – VadaTech, a leading manufacturer of integrated systems, embedded boards, enabling software and application-ready platforms, announces the AMC640 and AMC641. The AMC640 is an M.2 Host Bus Adapter (HBA) which supports up to four M.2 type 2280 and /or 22110 style storage devices. The NVMe storage provides high speed and low latency read/write to the SSD devices. Both the AMC640 and AMC641 are available in air-cooled (MTCA.0 and MTCA.1) and rugged conduction-cooled versions (MTCA.2 or MTCA.3). Please contact VadaTech sales for additional details.